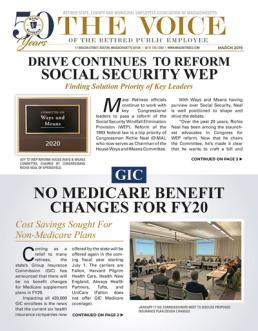 SEPTEMBER 2013 VOICE: In its second annual report on out-of-pocket costs (OPC), the state’s Group Insurance Commission (GIC) has found that the non-premium costs borne by retirees and employees actually dropped 3.8% between FY11-12. The $77 million savings lowered the average OPC to $1,030 per enrollee. OPC includes copayments and deductibles paid when accessing health insurance benefits. It does not include insurance premiums and the cost of over the counter drugs that are not covered by insurance. AUGUST 7, 2013: The Joint Committee on Public Service has announced that on October 31, 2013 it will hold the long awaited public hearing on H59, Governor Deval Patrick’s proposal to reform retiree healthcare benefits. As members know, H59 largely reflects the findings of the 2012 Special Commission on Retiree Healthcare, on which our Association held a seat. Legislative Liaison Shawn Duhamel represented public retirees on the Commission. JUNE 13, 2013: A bill that would allow dentists to negate contractual agreements with insurance companies that offer discounted pricing on dental care is now pending before the Joint Committee on Financial Services. The proposal, if passed into law, would allow dentists free reign to set prices on dental services at any level they choose, once a patient exhausts their annual dental insurance benefit. MARCH 6, 2013: Once again the state’s Group Insurance Commission (GIC) has been able to hold the line on insurance premium rate increases, beating both the state and national averages for an average increase of 3.5% across its offering of health plans.